Last weekend was a momentous weekend in my years on the farm. 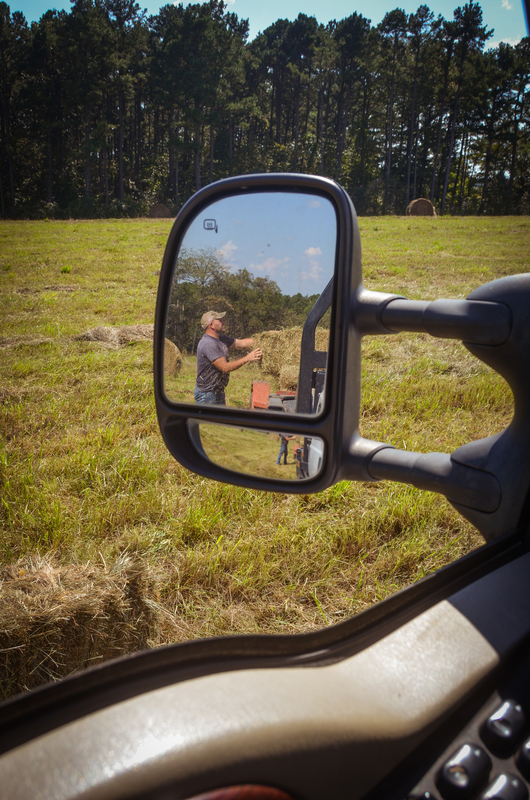 It all started with knowing Dad, Mandy, and the farmer would be gathering up all the square bales from a neighboring farm we cut hay off of and split between the owner and ourselves. So, I was aware of what Saturday’s plans were; I just wasn’t aware of what MY plans were until my dad informed me Friday night that I would be driving. Driving meaning I would pull the trailer with the truck as the rest of them walked along beside, picked up the square bales, and hefted them onto the trailer. Sounded simple enough even though I’d never done anything like that before. So, what do I do? Arrive ready to do it straight up farm girl. Dad has to hook up the trailer and tells me to go ahead and drive the truck to the field. 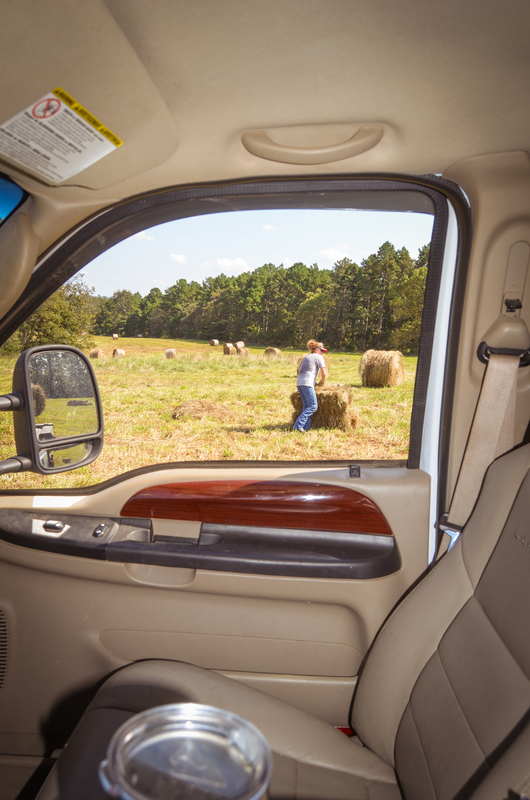 Since he’s in the passenger seat, I’m already feeling a fair amount of anxiety–because I have a good feeling he’s not going to get in the driver’s seat and back the honkin’ truck up to the trailer himself. Dad: “No, I’m going to coach you. Oh no…said the city girl who 1) is not an expert backer and 2) cannot read hand motions or follow directions. The farmer was already headed down the dirt road and saw us–or more importantly me in the driver’s seat–cross the road into the field. He later told me he wished he could have stopped and watched because he knew it would be good. Brat. So, he has me swing around to where the hind end of the truck is in front of the trailer, hops out, and proceeds to wave me on back. “Ok, straighten up a little! How is that straight?? He’s walking towards the driver’s side window. It wasn’t. I was looking at the tires the whole time. Ok, so now that we got that part accomplished, he continues to hand motion me back ward and then throws up the fist that means stop. Well, I found that the difference between my husband’s fist and my dad’s fist is that Dad means for you to slam on the brakes while my husband means an easier stop. Therefore, I have to pull forward again. Finally, we got it as Mandy was pulling into the field on the side by side. Dad waves and points at the truck like “HA HA! Isn’t this a kick in the head?” Her expression mirrored his. Long story short, I’ve watched my husband more than I realized, swung wide where I needed to, used my mirrors, and trusted Dad to tell me how best to maneuver through tight spots. So, now it was my turn to learn what “bucking bales” was all about. Even though it was 94 degrees outside, look how beautiful it is! It was my job to slowly drive the trailer down the lines of square bales so all the farmer and Mandy had to do was walk along and throw the bales on the trailer. Then, Dad grabbed them–as I’m continuing to drive, mind you–and stacked them. He may be eeking ever closely to 60, but he’s still spritely. Staying on two feet while stacking 60 lb. bales on a moving vehicle is definitely for the sure-footed. I’m just guessing here, but the “bucking” part seemed to have to do with your knee motion as you heft the bale onto the trailer. You use your knee for an extra nudge up. You don’t know how many times I giggled thinking about making the farmer chase the trailer with one of those bales. If Dad and Mandy hadn’t been working like dogs themselves, I totally would have done it. Don’t feel bad for him. He’s ornery. There’s Mandy. I got the cush job, for sure. She’s She-ra. Fun fact: Mandy did not grow up on a farm and had no experience with farming until she met my dad. 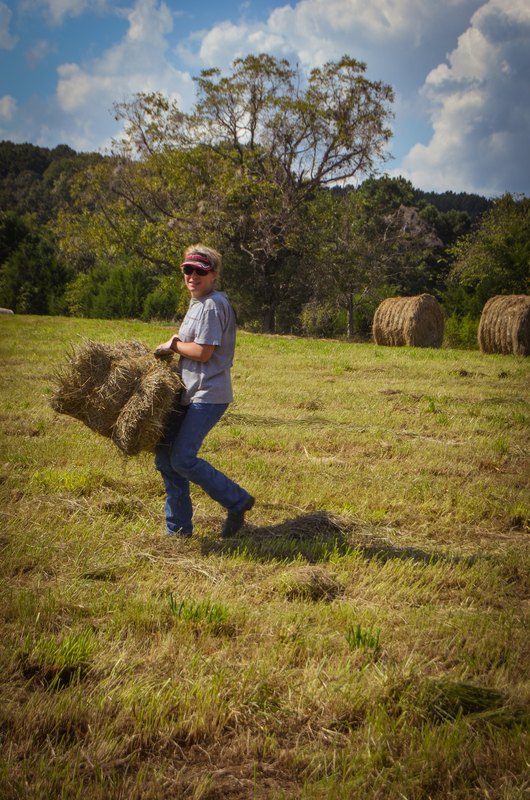 And yet here she is, buckin’ bales and later shouting “GIRL POWER! !” as she jumped out of the truck after grabbing a quick drink of water. I’m feelin’ it, man. I’m driving the diesel in 4-low with a trailer full of hay behind me. The trailer soon grew as full and high as it could get. I gladly hopped out of the truck and into the backseat so Dad could drive. I wasn’t feeling so confident in my newfound skills to think I could maneuver the squirrely path back to the highway without losing half the bales. In no way did I want to be the person that made all this hard work for naught. And when Dad lost about 8 bales in a ditch along said squirrely path, I was just thankful it wasn’t me. and go to work undoing all the work we did before. And by we, I mean not me. I have the VERY important job of making sure all of this gets documented. First, one must pick up the bale. to stack it all over again. Mandy climbed to the top of the heap to continue to push bales down for the farmer to throw. He likes to throw stuff. The sweaty assembly line. Mandy may or may not have tried to take my beloved out a couple times with a flying hay bale. Don’t feel bad for him. He’s ornery. Sweaty sweeper. Boots were not working in anyone’s favor that day. If you look at the two above photos, you’ll see that the truck and trailer is practically parked up a cliff. 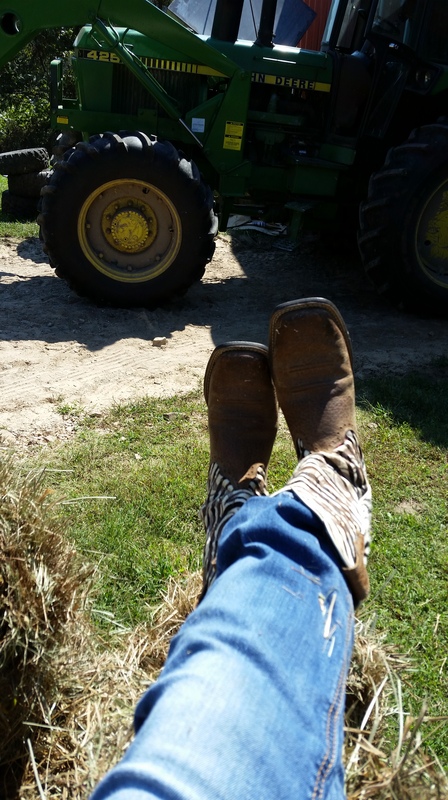 Slick hay + very worn boots = an extra element of fun while working. Sliding around like they were on slick floors with socks was not part of the objective that day. So, we look like OCD farmers instead. Something appears to have my dad very perplexed here. Mandy doesn’t take herself too seriously. That’s one of the things I like about her. Are we surfing or working here? Well, both…in an attempt to keep herself from sliding off all the bales straight into the farmer. I personally think Mandy and I add a lot of fun to the workplace. They wouldn’t know what to do without us. No laughter. No shenanigans. Possibly more productivity. I mean, can you imagine? But seriously, Mandy’s one of the hardest working women I know. We still had some bales left to load, so back to the neighbors for the rest of them. 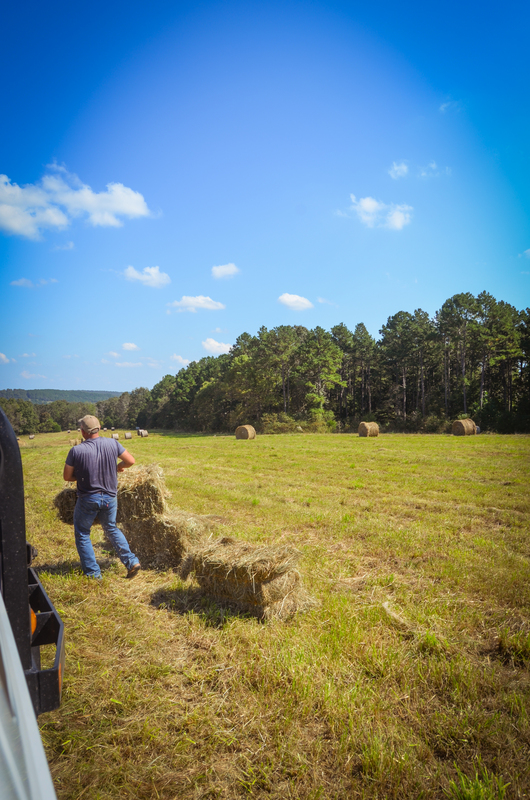 After those were loaded, Dad and the farmer had some straggler hay in the corners of the field. In goes the hay, out comes a square bale. The farmer hopped in one tractor and Dad had to drive this one out. Mandy was in the passenger seat of the truck. Who does this leave driving the truck with a trailer load of hay down the squirrely path to the highway? ME! This is bad…this is very, very bad. But, you know what? I made it. I made it the whole way. Without losing ONE bale which totally showed my Dad up. It mattered in no way that they double strapped everything that time. In honor of Mother’s Day, I wanted to write something for the moms that shaped my life. I had the privilege of being surrounded by some very special women as I was growing up who each had a very unique influence on my life. In fact, they still do. She’s number one on the list and she’s number one, period. She gave birth to me. She raised me. After I had Peanut, my appreciation for my own mother soared to new heights. Newborns are a lot of work with little reward at first. I reflected on my mom being a first-time mom with me and I knew that somebody felt the same love and responsibility towards me as a child that I felt towards my own. 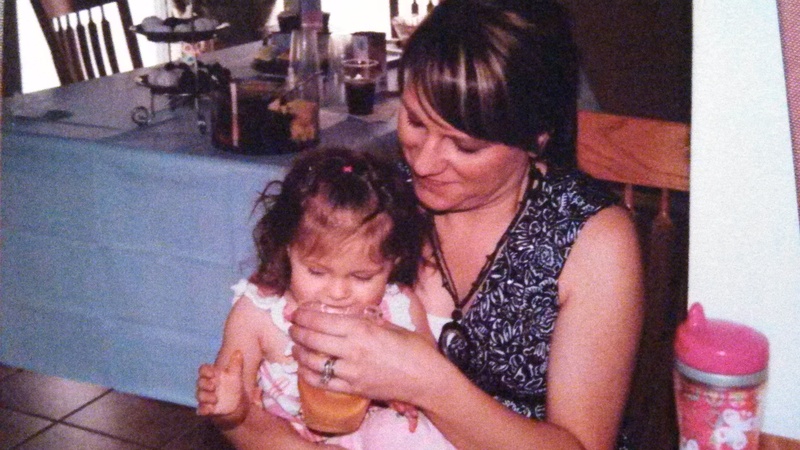 Knowing the power of my own feeling about motherhood helped me realize hers towards me. And I had to call her and say, “Thank you, I never knew exactly what it took until now. As a little girl, my mom was everything I wanted to be when I grew up, naturally. She was the epitome of beauty, class, grace, and poise from the beautiful suits and dresses she wore to work to just the way she interacted with people. She was quiet, but warm. My mom has always had a way of putting people at ease. She’s easy to talk to, full of wisdom, and never judgmental. She taught me all about how to walk in heels, how to appear graceful (even though I might be one of the biggest klutz’s in the world), and she shared with me a love of fashion and make-up. Even though she worked full-time and was a single mom, she never missed a school birthday party and brought cupcakes. She’d surprise me with McDonald’s for lunch every once in a while. I remember all the little kids asking me if my mom was a super model. Seeing her walk into school always made my day because I was so proud of her. And she was always sitting front and center for every school play and concert. She juggled a lot when I was little, but still created happy memories for me even amidst seasons of upheaval in our lives. She gave me confidence as a child and told me to “never brag to others. Only to Momma. I want to hear every last detail about how awesome you are.” She’s still the first person I call when I’ve been successful or have good news to share. Our personalities are very different in some ways. I’m a little more high-strung. However, I watched how that comforting presence worked as a child and try my best to exude it myself. It helps me temper the type-A, compulsive side of myself. Mom somehow found a way to help me figure out how to be both driven and likeable at the same time. Other women have had a very strong influence on my personality, but there’s just no way a person can have more influence than your mom. And no matter how old you get, she never really stops raising you. And you never really stop needing her to. Wild horses could not have dragged this wonderful woman away from anything my cousins or I were ever involved in. She’s my dad’s mom and without her, I might not have known that side of my family and that would have been such a terrible tragedy. My parents divorced when I was five and my dad left Missouri, worked in multiple states, and just wasn’t around much. However, my parents shared joint custody and it was Grandma that usually came and picked us up on Dad’s weekends. We got the chance to play with our cousins, bond with our aunts and uncles, and go to church with people that I adore and still go to church with. Even if it wasn’t Dad’s weekend, Grandma would still come and pick us up for church if we wanted to go. No matter how far out of her way she had to come. Sometimes, my mom would meet her with us. Mom never tried to stop us from going with Grandma. 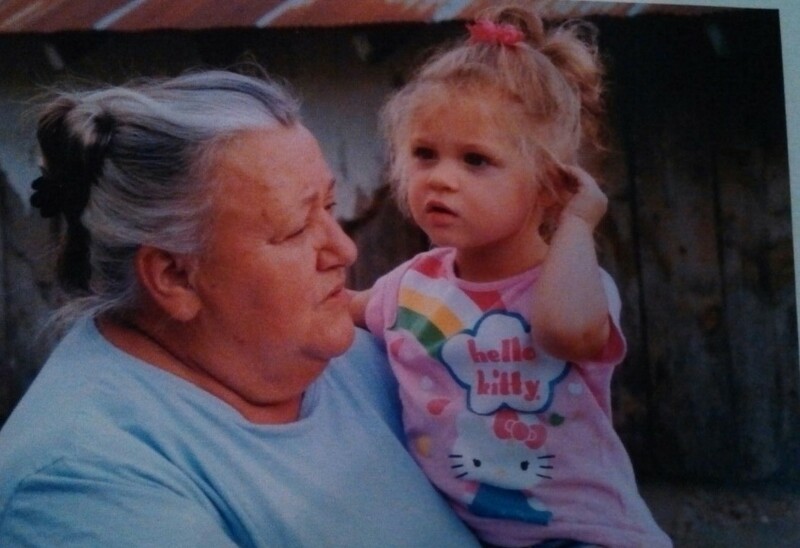 Raising kids that loved the Lord was important to her, as well, and Grandma was always tickled pink to come get us. I’m surrounded by musical people on both sides, but Grandma never stopped singing. She taught me all about how to sing gospel and I remember how all of us kids would just sing song after song with Grandma. I still can’t get enough of singing and a lot of that has to do with her. 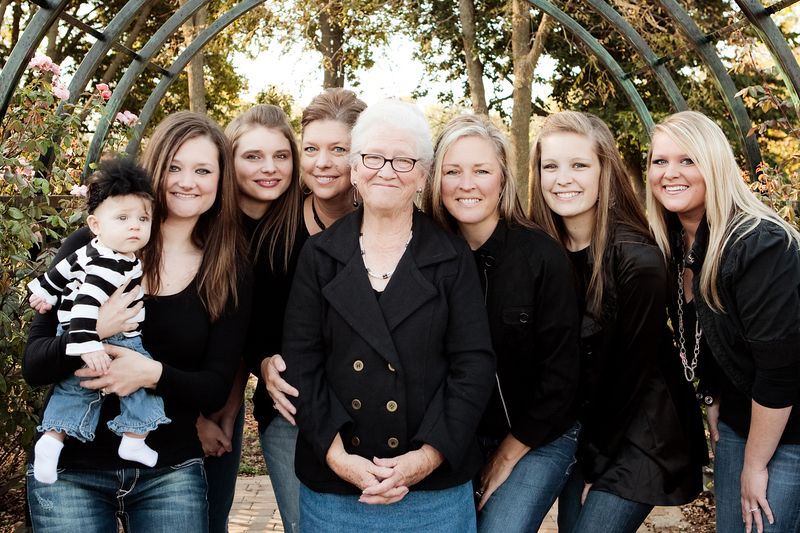 Another thing that is so wonderful about Grandma is her love. She loves everybody. She’s warm, kind, generous, and I’ve had friends adopt her as their grandma. I’ve never encountered one person in my entire life that doesn’t like her. Just saying her name alone makes people smile, even if they haven’t seen her for years. She’s something else and an immeasurable part of why I still walk in Christ today. Thank you, Grandma. I love you. Still playing. 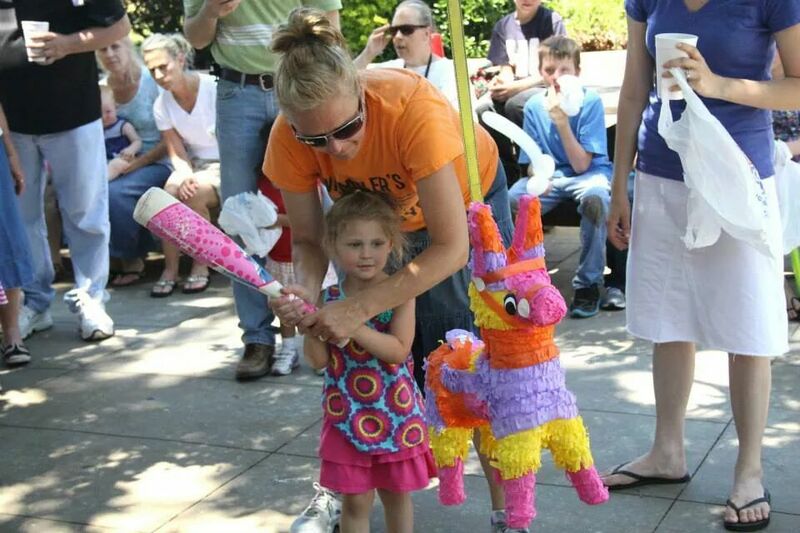 🙂 Helping Peanut hit the piñata. Deja vu. Aunt Rachel is that aunt that you just absolutely adore. She is my dad’s sister and when I was growing up, I thought she was the coolest thing ever. Her energy was endless and she was always up for a good time. Rachel didn’t just send us kids out to play; she played with us. She taught me how to bat, helped me swim, drove us around with Ace of Base blaring while we all sung at the top of our lungs, set us up at the dining room table with an endless array of crayons, colored pencils, paper, stickers, etc. You name it, she had it. Her kids and my other cousin, Alisha, are like my own siblings. We all loved going to Aunt Rachel’s because her home was filled with fun, love, and peace. Rachel and her stable, drama-free life was always such a constant for me. I always felt so safe there because nothing ever changed. And I look back now and admire her so much for taking on a passel of kids for a weekend and doing it without seeming the least bit overworked or haggard. As I got older and entered my teenage years, I turned to Rachel a lot for guidance. She seemed to always have it so together. I wanted to be just like her in that regard. We are kindred spirits when it comes to knowing exactly what we want, but once in a while, I needed her input on whether what I was wanting was a good thing or not. She never led me wrong and she was always one of the most encouraging people in my life. She believed in me and her faith in my ability to do whatever I set my mind to was always a driving force. Rachel was always laughing, always smiling, and always outgoing. Studying her helped me become more that way. I wanted to have the comforting, calm presence of my mom, but be able to be comfortable in my skin around whoever I encountered like Aunt Rachel. She taught this somewhat introverted girl that being quick to smile and laugh opens a lot of doors. Like my own mom, she was always encouraging me to let people see the person she saw. She always told me how funny I was and that I needed to speak up more. It was always my mom and my aunt Rachel that appreciated my sarcastic, goofy, sometimes morbid, sense of humor and that gave me confidence in myself. Today, I would say that I’m a pretty even mixture of my mom and Aunt Rachel. Not exactly like one or the other, but a mixture that makes me uniquely me. Thank you, Aunt Rachel, for always being so solid. You taught me about home and gave me a picture of how I wanted my own to be. I love you. Happy Mother’s Day! 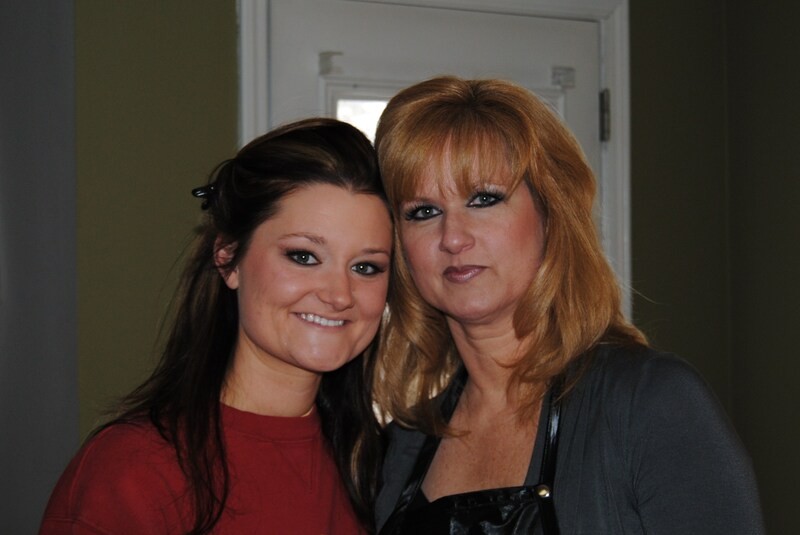 She didn’t raise me, but she raised the man I’m married to and without him, I wouldn’t be the person I am today. He picked me up, dusted me off, and showed me what love was supposed to be. The farmer restored my faith in humanity. He showed me that some people don’t expect anything from you; they just do things out of the kindness of their hearts. He could never have done this if he didn’t possess a kind, generous, selfless heart…just like his mother’s. Fae has never been anything but kind and welcoming to me and I love her dearly. Peanut loves going to Grammie’s house and Fae just lights up every time she sees her. It warms my heart. Fae, you are part of the village through your son. Your heart shines through him and I can’t even articulate what he is to me or what he’s done, but I know he wouldn’t be the man he is without you. Thank you for raising the man that saved me and thank you for everything you still continue to do for Peanut and for us. We love you. Happy Mother’s Day! Mandy didn’t come into my life until I was already married to the farmer. My dad had brought her back to Missouri with him and something about her quiet, down-to-earth nature made me feel like maybe he had somebody special here. He must have thought so, too, because he married her. I’ll admit that my relationship with my father was a little better than non-existent at the point she came into my life. He and I had very little in common (I thought), and I found it difficult to be around him, let alone carry on a conversation. It wasn’t that I didn’t want to, I just felt like maybe too much time had passed for me to really bond with him. He had missed out on so much and I knew nothing about him, as well. However, with Mandy, she and I had to get to know each other, anyway. She learned about me and I learned about her as well as learning things about my dad that I didn’t know. I’m sure my dad learned about me from her, too. She was the messenger there for a while, but, over time, she created this bridge through which my dad and I were able to reconnect. Eventually, Dad and I had a conversation where he just laid it all out and I saw his heart. That was when my defenses officially came down and I’ve never looked back since. Mandy instigated all of that. She helped Dad see what he needed to do to get back on track with me and she helped me see that he really wanted that. She gave me hope. After I had Peanut and I’ve seen how my dad is with her, I can’t help but melt. He’s my dad. I never stopped loving him, but he makes it so easy now. He makes me proud. And then, Mandy, as if you didn’t already do enough, you love my daughter. You love her like your own. You helped me so much with Peanut and there’s a special bond there between the two of you. I can’t put it into words, but it oozes out when you’re together. She thinks you’re great and so do I. Happy first Mother’s Day, Mandy! When you had Chaser, I’ll admit, I was worried about whether you would be able to balance it all. I shouldn’t have worried. I mean, this is you we’re talking about. You still continue to go above and beyond. You do your best not to miss anything and I love you so much for that. Thanks for being Peanut’s “Nanny” and a person that she can always count on. I’m certain that she will consider you part of hervillage when she reflects back. You’re also a person I can always count on. Thanks for being my friend. That is my village and I thank God every day for placing these women in my life. Each one of them is so special and I’m blessed to know them.